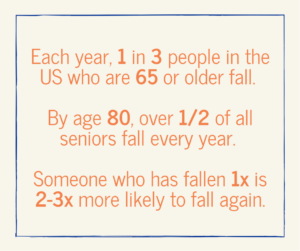 Falling is a major contributing factor to the deterioration and death of the elderly. Community awareness can help us prevent falls in our loved ones and preserve their lives for what may be (many) additional years. One in every three people in the US above the age of 65 falls each year. By age 80, over half of all seniors fall every year. Someone who has taken that first serious fall is 2-3 times more likely to fall again. Falling leads to injuries and fractures in the body which make it the leading cause of death among the elderly. Many will be admitted to the hospital; after admission, 40% do not return to independent living…. and 25% die within a year. These statistics are alarming and difficult to digest. Even so, they are actually most likely far lower than actual numbers, because many falls are not reported. 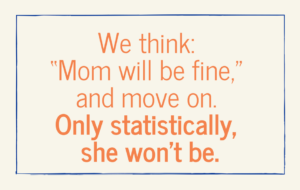 We think “Mom will be fine,” and move on. Only statistically, she won’t be. The core causes of falling are issues with balance, strength, or both. One’s strength might be impaired by lack of physical activity or surgery. When it comes to balance there are several factors: impaired vision, medications (use of multiple medications), and diseases to name a few. Environmental hazards like poor lighting or loose carpeting can have an impact as well. Statistically, women have a higher risk of falling than men. This is most likely because of the alarming rate of hip fractures from falls specifically in women. As this 2014 NPR article highlighted, breaking a hip can lead to a range of other frightening health complications for older adults, including the fear of future falls and significant loss of independence. And women are particularly vulnerable: among older adults, the rate of hip fractures in women is more than twice as high as in men. Ustep walkers, created with specific features for those suffering from neurological conditions such as Parkinson’s and Multiple Sclerosis, have a unique design for fall prevention. The Hallmark of the U-Step is the “U” shaped base that surrounds you, bracing you from falling in every direction. 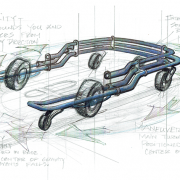 In addition, the “squeeze-to-go” braking system and the rolling resistance control, are integral for safe walking. Inactivity and being confined to a wheelchair or bed rest, on the other hand, can cause a loss of strength and endurance and harm the healing process. Studer adds: “The use of a structurally-sound walker, such as the U-Step, can afford the option of greater support, and less pain-induced compensations in efforts to walk – which can be equally damaging. The biggest challenge in fall prevention is that no one wants to begin using a device to prevent falls…. until they have fallen. Convincing someone whose mobility is deteriorating to make this type of change in lifestyle prophylactically is very difficult. 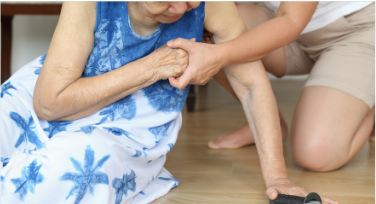 If you or a loved one is showing any signs in increased weakness, problems with fatigue, balance or has had a “scare” or “almost fall”, now is the time to look into options. Having a frank discussion about preventing falls, looking into devices that can help today can make all of the difference in the world. 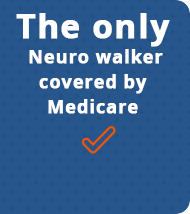 Speak to your doctor and discuss your mobility concerns. Speak to a physical therapist or visiting nurse about what options may be best for you. Thinking ahead, being realistic and anticipating the danger can make a life-saving difference.